No, I’m not talking about the Babylonian crescent I’ve used as a logo, for most of the time I’ve been online. Nor am I talking about what you would see if a Smurf dropped his pants. Tonight is the second full moon this month, a so-called “blue moon.” That only happens once every two and a half years. Since mid-March we have done two radon tests in the basement, and both times I got an e-mail from the lab in North Carolina, stating that the air sample I mailed them arrived more than twelve days late, so it could not be used. The second e-mail arrived yesterday. What gives? I mailed both on the day each test was finished. When I called the lab the person on the phone showed no sympathy whatsoever. Guess I’ll have to send it overnight mail next time; that bites. This morning the radio warned about cows in the road in three locations on the outskirts of Lexington, telling listeners to “watch out, if you don’t want steak for breakfast.” I can’t remember ever hearing a news story like that from Florida, except maybe for the bear that wandered onto South Orange Blossom Trail, Orlando’s notorious red-light district, a couple of years ago. In previous jobs, it helped me to commit as many area codes to memory as possible, for both the USA and Canada. Thus, if you asked me for the numbers and locations of Florida’s area codes, I could recite all seventeen of them. Kentucky has four: 606 for the eastern mountains, 859 for the Bluegrass country, 502 for places just west of here (Louisville, Frankfort and Mammoth Cave), and 270 for the part of the state so far west that it’s in the central time zone. 270 includes Paducah and Owensboro; I would have thought that area code had fewer people than the others, but today it was announced that in a few months, 270 would be split in two. The new number hasn’t been announced yet, but I’ll probably tell you when it is. That’s it for now; if I think of anything else worth posting, I’d better save it for June. Don’t worry, June is only an hour away. I think May has been the busiest month so far for this blog. Yesterday was the first time in nearly three weeks that I was too busy to write something. But seriously, when I got home from work yesterday, I found Leive and Rezia assembling the desk we had ordered in March. I would have gotten to it eventually, but the bookcases were giving me so much of a challenge that I didn’t want to start a new project until I was done with them (the last bookcase is still half-done as I write this). Still, Leive was tired of seeing the pieces of the desk lying around, and Rezia was bored. Would you believe they finished it? As for the other bookcases, yesterday I started arranging the books in them by subject, to make the books easier to find. Leive had put them there last week in no particular order, just to get them out of the boxes. Between the four completed bookcase, there are a total of 35 shelves, and I have completed filling and arranging the books in 11 by now. So far so good, it looks like we’ll have enough room for the videotapes as well as the books. 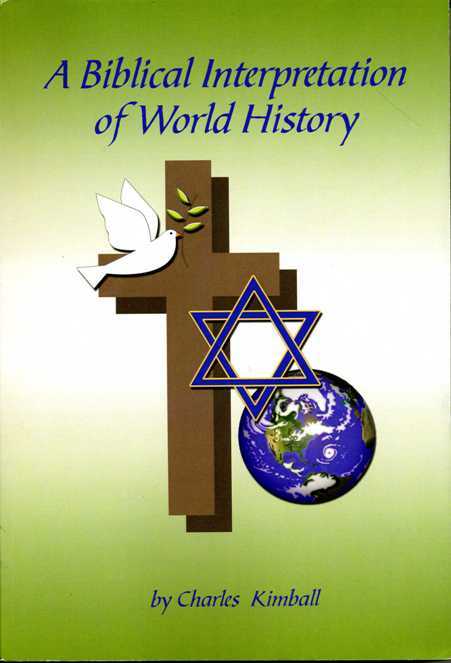 At last night’s prayer group I gave a history lesson on the Tower of Babel, since the pastor is away. It was the same lesson that I gave the Thursday night group a couple of weeks back, but they appreciated it nonetheless. I’m glad somebody enjoys hearing what I’ve discovered (Leive doesn’t). Well, it’s time for bed; let’s see what tomorrow will bring. For Memorial Day I took Leive and Rezia on a quick trip out of town. First we went to a nearby Chipotle restaurant for lunch. Rezia had developed a taste for Mexican food during her time in San Antonio, and was missing it already, while Leive was willing to give Chipotle a try after I told her it was a Mexican version of Subway. Myself, I remember Chipotle places opening in Orlando a year or two before I left Florida, but I didn’t get around to trying them until the one near my church in Lexington offered free Sunday burritos last July. When you get off the highway, this sign lets you know you’re there. 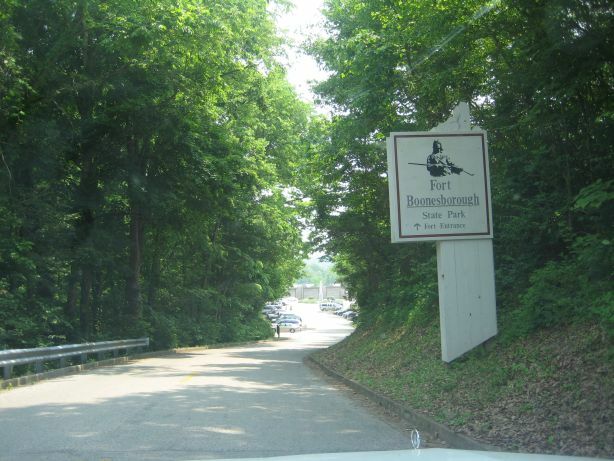 The entrance to the fort itself. 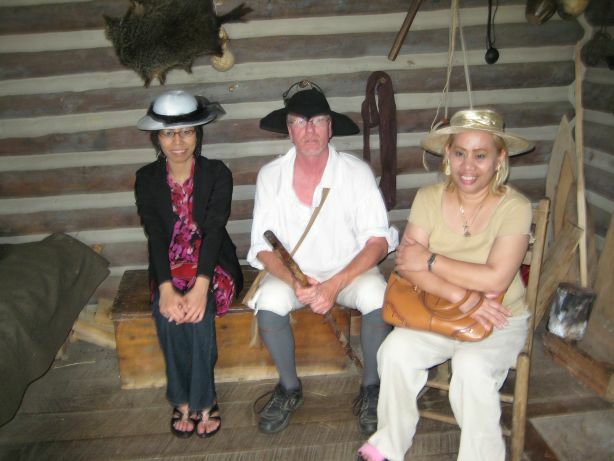 Here in one of the cabins, you see Rezia and Leive with a tour guide (the park employees wear 18th-century costumes). Judging from the attention they got, I don’t think the fort has many visitors from the Far East. 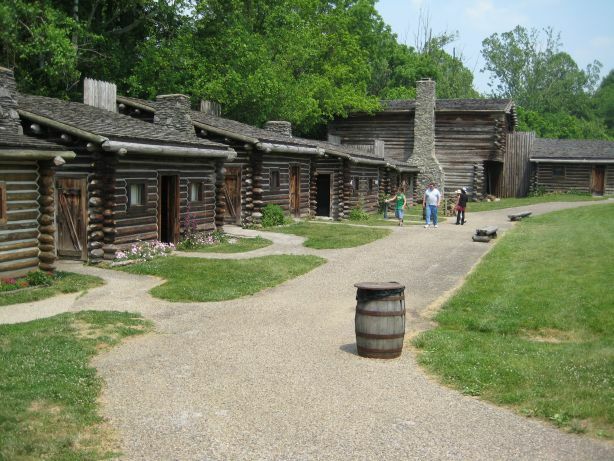 Here you can see several cabins in the compound, and a blockhouse in the back. Afterwards Leive picked a leaf from a flower outside the fort that really amazed her; it looked and felt like a piece of rabbit fur. I’m going to try to find out what it is, when I get the chance. 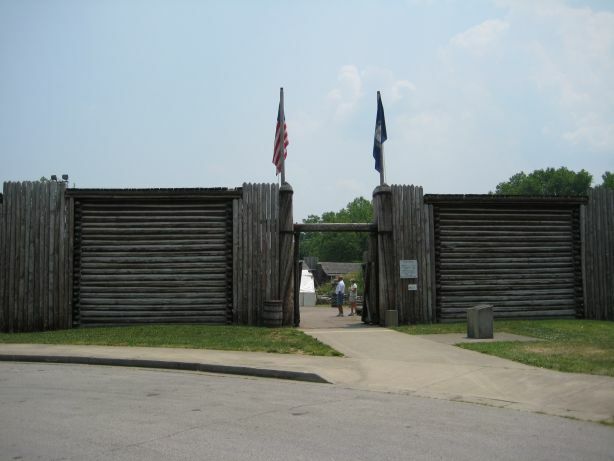 Before returning home we went to the Kentucky River, to see a small museum dedicated to a canal lock in the state park, since admission there was included in our ticket to the fort. This evening Leive made pancit, and Gene came over to show Rezia a DVD he had of a Kirk Franklin concert. I’d be keeping them company now, but I promised I’d try to get the router set up, so Rezia won’t have to take her laptop outside to access the Internet. Tomorrow I go back to work, so I’ll see you later! 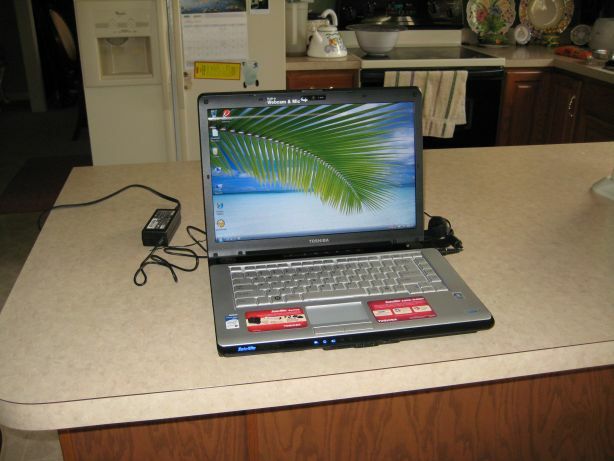 Here is Leive’s new laptop, a Toshiba that we picked up at Best Buy yesterday afternoon. Dual-core 1.7 GHz processors, 2 gigs of RAM, and a 200 GB hard drive. The chips and RAM are as good as what I have on my desktop computer, and the hard drive is actually better. Still, it cost a lot less than Lindy’s laptop, two years ago. Don’t know yet what Leive plans to do with it, besides storing pictures that we take with the digital camera; as is, I’ll have to hold her hand until she knows how to use it. It’s a learning experience for me, too, because it has Windows Vista, and this is the first time I’ve had a chance to try the new OS. As you can see, we found a wallpaper she likes, but the screen savers were boring, so I installed a screen saver with a coral reef theme, one I haven’t used since 1999. If nothing else, it proved that old bit of software is Y2K compliant. She won’t have an Internet connection until I get a router set up, which will connect her to my Insight Broadband service, unless she wants to go outside and try accessing a friend’s wireless network. She’ll also have to wait until then to try the Microsoft applications installed, because apparently a license agreement has to be signed first. Lindy, you may have to wait a bit to e-mail Mommy! And Happy Memorial Day to anyone else reading this. Take a minute to remember those who paid the ultimate price, so that the rest of us can enjoy a day off at the beginning of summer. I just saw the video posted on Fellowship Church’s weblog, where JoRene Garrison plays a song about the dad she never knew. Now you can see what the main floor of our house looks like. This time it took 16 pictures to do it justice. Included are the kitchen, living and dining rooms, and family room. Click here or on the link in the left-hand margin of this page, and enjoy the view! Rezia seems to be adjusting to Kentucky nicely enough. Quicker than Leive did, anyway, but then Leive arrived at the beginning of winter and had to go “cold turkey”–literally. At 3 PM Jim Latimer, the music director of the church we’re attending, came over to see the place and get acquainted with Rezia. He invited us over to the meeting they hold in the church before the Saturday night service, so we went at 5. Though it was Rezia’s first visit to the church, she was asked to join the singers up front, and did so. We ended up going on until 9:30, more than half an hour later than usual, but she loved it anyway. I think Leive and I are having an influence on Jim, too; he’s now playing some Hebraic songs I haven’t heard since leaving Florida. Afterwards Gene King followed us back home for dinner and a chance to meet with Rezia. I went to bed at 11:30, but I hear the others stayed up at least until 1 AM. All in all it was a very nice Shabbat. Leive’s niece arrived at 9:30 PM last night. In fact, we saw her plane come in as our car approached Bluegrass Airport. This airport doesn’t have airplanes coming in every minute, the way Orlando International Airport does, so it’s easier to tell them apart. Anyway, we picked up Rezia quickly and without incident, and took her to the same Chinese restaurant that Leive went to, after her arrival last December. Our meal there was rushed, because the workers were starting to clean up and close down the place for the night, but no matter. Rezia was impressed with our house all right, so much so that it took her quite a while to find the piano she has been eager to see. Once she did, though, she and Leive played and sang for a good long time; we didn’t go to bed until it was almost 1 AM. This morning it looks like Leive is preparing several of her recipes for lunchtime; I saw fruit salad, yellow rice, cans of mushrooms, frozen French fries and tilapia in the kitchen. However, we don’t know yet who will be coming. As is, I had to wait an hour to get my breakfast & coffee, to stay out of her way. At work, I got a pin for one year of service with the company, and learned I’m getting a small pay raise. Therefore I’d say I had a good day on the job, too. Leive wanted me to earn more, of course, but we all understand I need more experience to qualify for that. Chris, did you feel left out when I didn’t put up a weather sticker for your part of Florida on Thursday? Here’s one for you; click on it for your forecast from Weather Underground.